The secret of Greenland’s quick rise to prominence, as well as its rapid decline, may have been walrus tusks. Sometime in the late 10th century in Iceland, one Erik Thorvaldsson was having a pretty bad day. Born in Norway, Erik and his family were forced to flee to Iceland after his father committed “some killings“. Erik was about 10 years old when this happened but, he realized today, he didn’t take the lesson to heart. Following in his father’s footsteps, Erik had also committed manslaughter — and was now forced into exile from Iceland. This paternal murderous streak, however, would echo through time and help shape the destiny of Europe’s northern countries. Erik sailed with his family and slaves, intent on finding his fortune on the wild shore to the southwest of Iceland. Icelandic Sagas hold that he christened the massive island Grœnland (‘Greenland’) and stayed there — thus creating the first Norse settlement on Greenland. Nestled in the frigid waters between the North Atlantic and the Arctic Ocean, however, Greenland is decidedly un-green. Historians are still split on whether the lands were lusher back in the days of the Vikings, or whether Erik simply had a knack for PR campaigns and an interest in tempting new immigrants into sailing over. What we do know is that it worked. People sailed in and by the mid-12th century, Greenland could boast two major towns, a population of several thousand, and even its own bishop. This rapid ascent was followed by a dizzying drop: by the 15th century, Greenland was virtually devoid of Norsemen, ruins of their settlements peeking out of snow across the land. How these colonies developed and declined so fast has long fascinated historians. One theory proposed that a change in climate patterns, coupled with antiquated farming technology, made it impossible for the Greenland Norse to feed their population — so they left. One other holds that the Greenland Norse never really farmed much, but sustained their population by trading commodities with Europe. Walrus tusks were a particularly sought-after commodity in the time, and Erik’s frozen island was rich in walruses. When trade declined, the Norse also faded into history. A walrus rostrum (upper jaw bone) with tusks that was used in the study. Dated to c.1200-1400 CE based on the characteristics of a runic inscription in Old Norse. Image courtesy of Musées du Mans. This latter hypothesis is further supported by archeological findings in Europe. 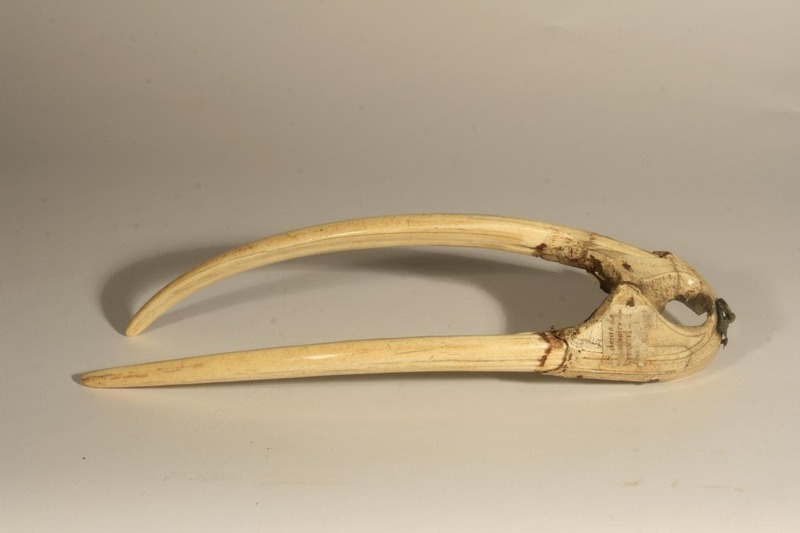 We’ve found many luxury items — from crucifixes to game pieces — fashioned out of walrus ivory in Europe around this time. However, the theory couldn’t be proved or disproved, as the source of this ivory couldn’t be pinpointed. New research from the universities of Cambridge and Oslo, however, successfully established the source of this walrus ivory. 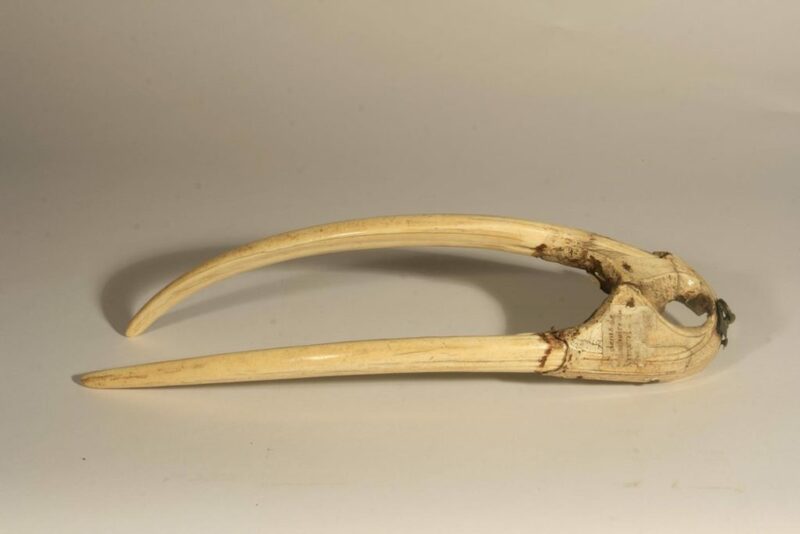 By studying the DNA in walrus tusks and skulls from ivory workshops across the continent, the team found that Greenland held a “near monopoly” of the ivory supply in Western Europe for over two centuries. The research also revealed an evolutionary split in the walrus, allowing the team to distinguish between ivory sourced from Greenland and that obtained elsewhere. The team worked with samples of walrus bone and tusk obtained from key medieval trading centers such as Trondheim, Bergen, Oslo, Dublin, London, Schleswig, and Sigtuna, dating between 900 and 1400 CE. 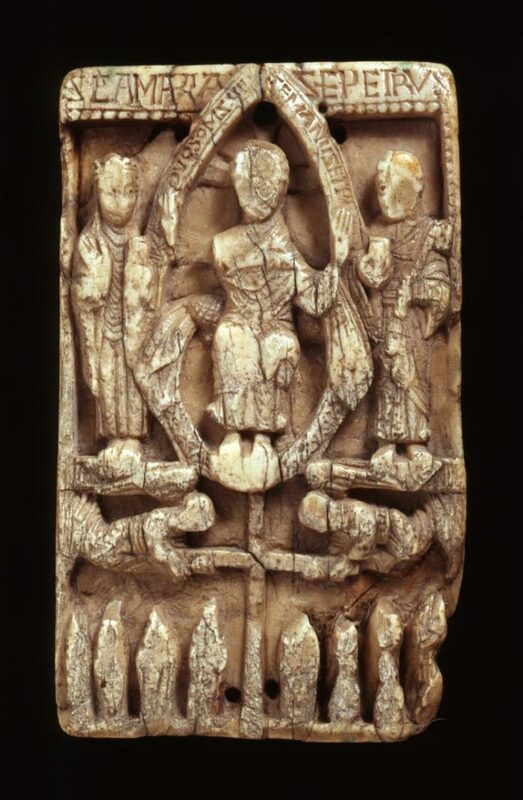 Ecclesiastical walrus ivory plaque from the beginning of the medieval walrus ivory trade; believed to date from the 10th or 11th century. Found in North Elmham, Norfolk, UK. Image credits Museum of Archaeology and Anthropology / University of Cambridge. The tusks were exported still attached to the walrus’ skull. They helped protect the ivory during shipping and was later broken up at each workshop. The team extracted DNA from the remains of this process, as to avoid damaging any artifacts. Ivory was carved into luxury goods such as religious objects and game pieces. DNA analysis revealed that the walrus branched into two lines during the last Ice Age — which researchers term “eastern” and “western”. The eastern lineage spread across much of the Arctic, while the western lineage remained contained in the waters between Canada and Greenland. The lion’s share of walruses during the early years of the ivory trade came from the eastern lineage, the team reports. As demand soared from the 12th century onwards, however, the supply shifted almost entirely to tusks from the western lineage — namely, from walruses in Greenland. The Norse settlers there either hunted the animals themselves or traded with indigenous populations for the tusks, according to the team. “Later Icelandic accounts suggest that in the 1120s, Greenlanders used walrus ivory to secure the right to their own bishopric from the king of Norway. Tusks were also used to pay tithes to the church,” he explains. Europe was faring pretty well from the 11th to the 13th century, and demand for luxury and exotic goods soared. The Greenland Norse cashed in on this, supplying almost all of the ivory in Western Europe during this time. However, craftsmen eventually switched over to elephant ivory — there is virtually no evidence of walrus ivory imports in Europe past the year 1400, the team explains. Left without a market for their single most important export good, the Greenlanders’ economy ground to a halt. “Changing tastes could have led to a decline in the walrus ivory market of the Middle Ages,” Barrett explains. There may have been other factors at work, however. 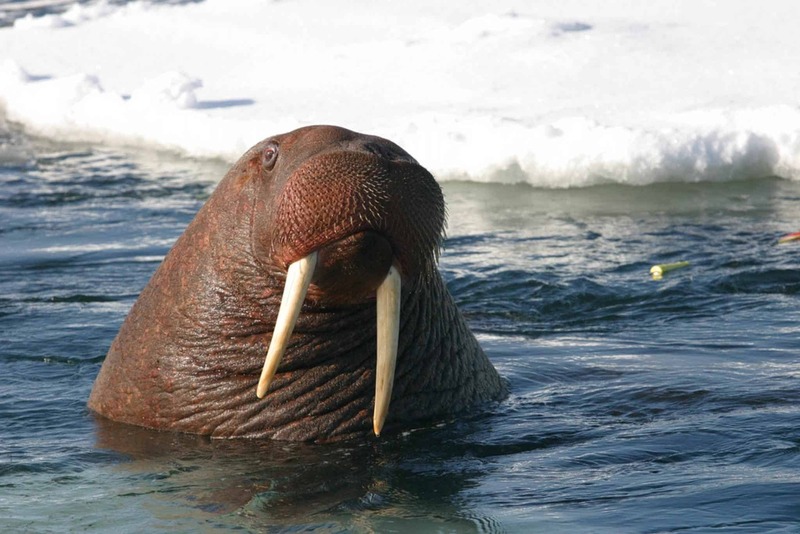 Walrus populations are known to abandon their coastal haulouts due to overhunting. The 14th century also saw the “Little Ice Age“, a sustained period of low temperatures. Finally, Europe was also going through some tough times, as the Black Death plagued the lands. “Until now, there was no quantitative data to support the story about walrus ivory from Greenland,” says co-author Dr Bastiaan Star of the University of Oslo. The paper “Ancient DNA reveals the chronology of walrus ivory trade from Norse Greenland” has been published in the journal Proceedings of the Royal Society B: Biological Sciences.